Being an endemic species with limited distribution, Romer's Tree Frogs (Liuixalus romeri) are susceptible to human disturbance and habitat destruction. 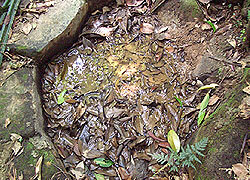 The eggs and tadpoles are also vulnerable to the predation by fish and other species of frogs. Romer's Tree Frog is a Protected Wild Animal under the Wild Animals Protection Ordinance. Hunting, willful disturbance, possession, sale or export of Romer's Tree Frogs including their eggs are subject to a maximum fine of HKD100,000 and to imprisonment for 1 year. In view of its ecological value and scientific importance of Romer's Tree Frog, a site that supports the largest population of the frog - part of Ngong Ping in Lantau, has been designated as a Site of Special Scientific Interest (SSSI) in May 1999. 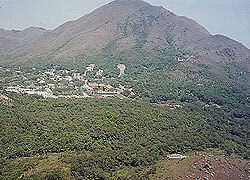 This SSSI includes both the breeding and non-breeding habitats of Romer's Tree Frogs in Ngong Ping. 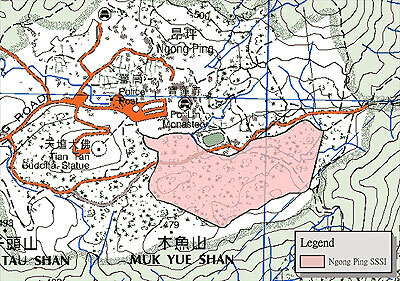 The area is zoned as "SSSI" in the Ngong Ping Outline Zoning Plan. Development within the site is subject to statutory planning control. Most of the Romer's Tree Frog sites on Lamma Island fall within "Conservation Area" on the Lamma Island Outline Zoning Plan. In the Environmental Impact Assessment for the Chek Lap Kok Airport Development Project conducted in the early 1990's, the endemic populations of Romer's Tree Frog fell within the development footprint. A study on the habitat use of amphibians in Hong Kong with special reference on Romer's Tree Frog was conducted by Dr. Michael Lau at the University of Hong Kong from 1991 to 1997 and funded by the Royal Hong Kong Jockey Club Charities Ltd. 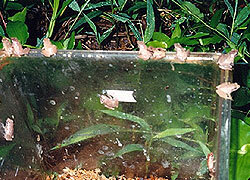 Rescue operation for Romer's Tree Frogs in the northern part of Chek Lap Kok in 1991 and 1992. Over 200 adults plus juveniles, tadpoles and eggs were collected and captive-bred in the University of Hong Kong and the Melbourne Zoo. 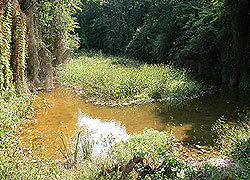 Over 1,100 frogs and 1,600 captive-bred tadpoles were released in the recipient sites in 1993 and 1994. Each site receives 90 frogs which form the founder populations. Earthen/plastic pots or concrete/butynol-lined pools were also provided to increase the number of breeding grounds. Breeding and establishment were successful in all sites except Tin Fu Tsai. The Herpetofauna Working Group of AFCD has initiated a regular monitoring of the Romer's Tree Frogs in the native and release sites since 2002. Surveys are conducted during the warm breeding season from March to September each year. The survivorship of Romer's Tree Frogs and their habitat conditions would be monitored.